“It ain’t rocket science.” We usually hear that phrase like it's beyond anyone's understanding, but it's not. 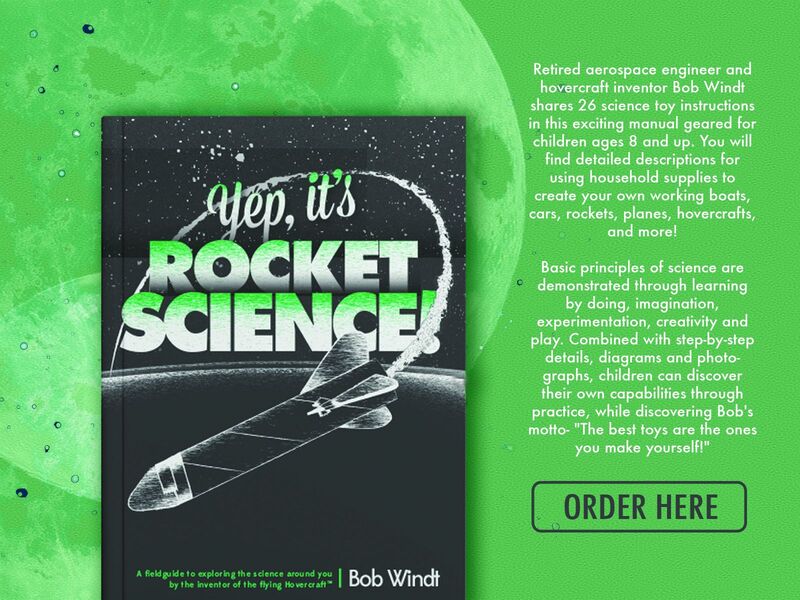 The basic physics of rocket science isn't that complicated, and Bob Windt has a mission: to inspire kids with science, experiential education, and hands-on learning. With “Yep, It’s Rocket Science!”, we have brought rocket science down to Earth, so children can understand it while using their minds, imaginations and their hands. Order Yours Today! "The best toys are the ones you make yourself!" Kids learn science, physics, and engineering through a hands-on, creative crafts manual. Beginning with the book "Yep, It' Rocket Science!" we have a vision to share Bob's creative genius with kids all over the world. We quickly are attracting our team to get this job done and this Web site is one of the ways we will do this. Image above or CLICK HERE! Bob Windt invited and filmed to be a contestant on Toy Box, 2nd season. This is a big deal! Check back often, and if you would like to be part of our team we would love to have you join us.